Panasonic recently launched an addition to the new Eluga series smartphones, the Eluga Note at Rs. 13,290. It will be available via offline retailers across India. 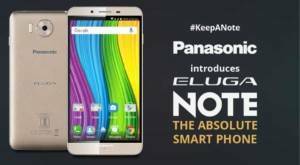 Read this article to know about Panasonic Eluga Note Specs and Price. What stands out is its 4G LTE as well as voice over LTE (VoLTE) feature. It allows voice calls over mobile data on supporting networks like the upcoming Reliance Jio network. Also featuring textured back design with removable back cover, it targets the youth with this launch. It also features a 5.5 inch full-HD (1080×1920 pixels) LTPS (low temperature polycrystalline silicon) display with a pixel density of 403 ppi. In addition, it is powered by an octa-core processor clocked at 1.3 GHz with 3GB of RAM and 32GB of inbuilt storage. This can be additionally expanded using a microSD card (up to 32GB). It features a 16-MP rear camera with triple-LED flash and f1.9 aperture. Backed by a 3000 mAh, it sports a 5-MP front camera. The dual-SIM smartphone supports 4G Indian LTE bands, 3G HSPA+, Wi-Fi 802.11 b/g/n, Bluetooth 4.0 and other standard connectivity options. It also includes inbuilt IR sensor to control IR based smart home electronic appliances. The colour available is only Champagne Gold. The smartphone will support 4G only on one SIM. It runs FitHome UI on top of Android 6.0 Marshmallow. FitHome UI is focused on providing single thumb-flick access to apps on the home screen. “Eluga Note equipped with full HD display, faster processing power and superior camera empowers the consumer to perform all their tasks at ease thereby making their life smarter and efficient. We are confident with Eluga Note, will enhance our market share as an emerging smartphones brand and further strengthen our position in the price band of Rs. 10,000-15,000.”, added Pankaj Rana, Business Head, Mobility Division, Panasonic India, at the launch.